Char Siu Pork | Saucy and delicious Cantonese Pork! For this recipe, I ask you to make twice the sauce as you will need to marinate the pork. This is because air fryers need the surface area of the meat you are cooking to be somewhat dry for best results. 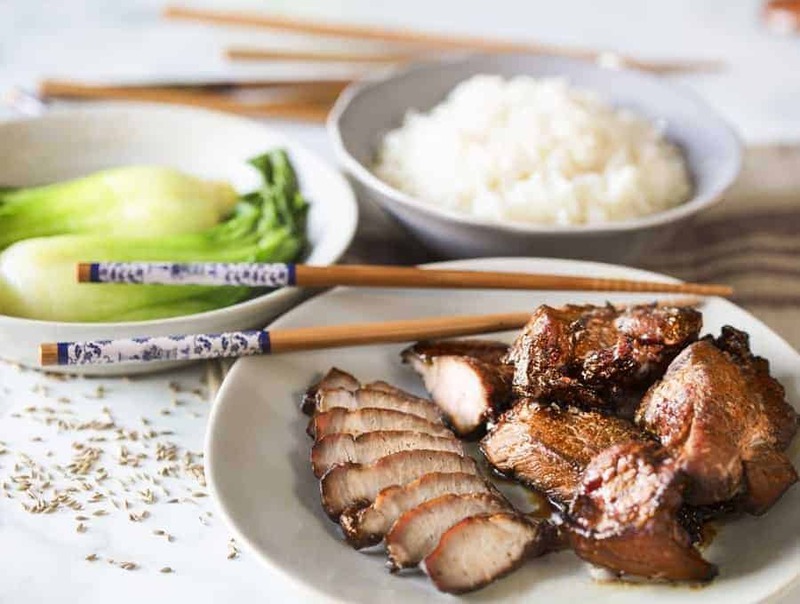 But I like my char siu saucy—just like me—so I will show you how to cook the extra sauce to get a lovely glaze or dip you can use with the cooked char siu. What is Char Siu Pork? If you’ve been to any kind of American Chinese buffet, you’ve probably had Char Siu Pork. It’s a Cantonese barbecue pork recipe that’s typically sweet and spicy and great with some rice or grilled vegetables. 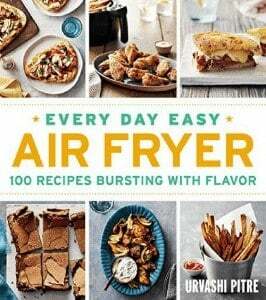 This recipe makes it so quick to make with the Air Fryer. This recipe does use Chinese Five Spice. If you don’t have it, but like cooking Asian foods, you really should pick some up. If you can’t find it at your local grocery store, you can get it on Amazon like I do – because really, who doesn’t like shopping in their pajamas? I find the air fryer to be just about perfect for fattier cuts of meat. The air fryer both renders and crisps up fat. It’s kind of a paradox because on the one hand it gets rid of some of the fat–but oh the fat it leaves behind! Juicy, and to die for. I also made my own sauce this time, since the jarred Char Siu sauce–which, don’t get me wrong, I absolutely LOVE–has an unreasonable amount of sugar in it. It’s even sweeter than the sauce I made with honey below for this. If you need a lower sugar version, you can try it with Truvia, but the results may not be as sticky and sweet as the recipe below. 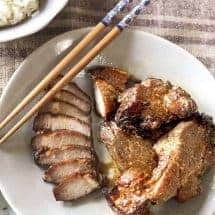 If you don’t have an air fryer or want to make this with jarred sauce, try this Oven Char Siu pork that’s also super easy. 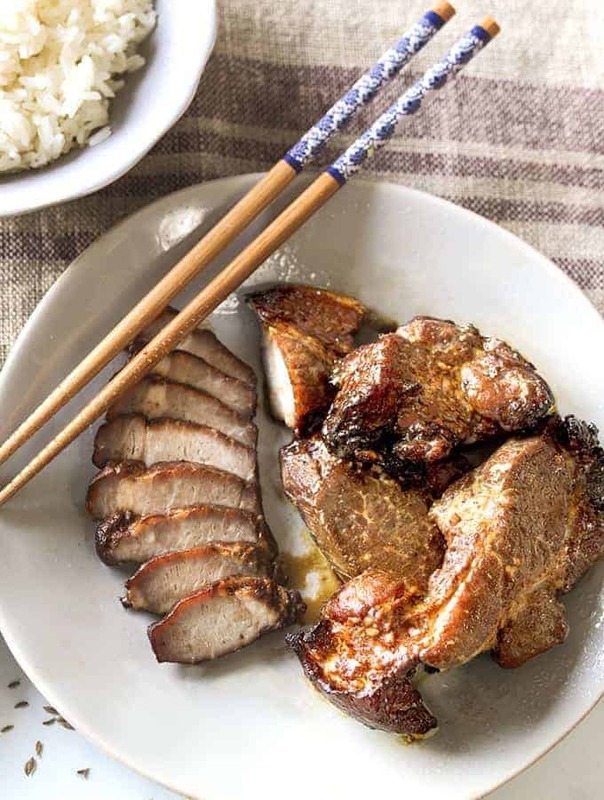 Use your Air Fryer to make this amazing Cantonese Char Siu Pork recipe! It's a traditional recipe made the modern way, and this version uses a homemade sauce. Using a fork, pierce the slices of pork well. Make the Sauce: Mix all ingredients for the sauce (except the pork shoulder) together in a small microwave-safe bowl. Place the pork slices in a ziplock bag or bowl, and pour in half the sauce. Mix well and let the pork marinate for at least 30 minutes, and up to 24 hours in the refrigerator. Remove pork from the marinade and place in a single layer in your air fryer basket. Set the air fryer to 390F for 15 minutes, flipping and basting the pork half way through. While the Char siu is cooking, place the reserved half of the sauce in the microwave and cook on high for 45-60 seconds stirring every 15 seconds. You are doing this to thicken the sauce a little. Since it has honey in it, be careful to not overcook otherwise you will have char siu toffee (ask me how I know). Using a meat thermometer, ensure your pork has reached an internal temperature of 145F. Remove the pork to a cutting board and let it rest for 10 minutes. Brush with the thickened, cooked sauce and serve. This recipe is a winner! I made xylitol simple syrup to substitute for the honey, which worked out well for us. Thank you, Urvashi!